Arabic is the official language of 26 countries that stretch from Morocco to Iraq and is spoken by an estimated 280 million people who live in the most access challenged and Biblically impoverished region of the world, but massive political and spiritual changes are underway in the Arabic world and millions are coming to Christ. 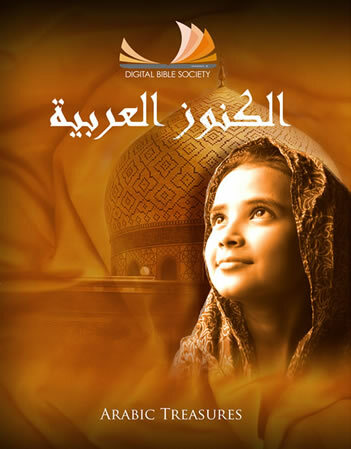 Arabic Treasures, the third major project undertaken by the Digital Bible Society, is the combined work of over 20 organizations and contains a vast amount of resources in text, audio, and video. The content is a combination of Bibles, e-books, video recordings, and audio recordings all divided into 12 libraries ranging from New Believers to Pastoral resources. Arabic Treasures libraries are available in a number of media sizes, ranging for 4gb to 32gb, to thumb drives and hard drives. The growing Arabic Treasures library contains several Bibles, Audio Scriptures, over 100 books, over 250 hours of inspirational, family and discipleship videos, over 700 hours of audio recordings, Bible study tools, artwork, and maps.